"[Colzani] may never have quite entered the pantheon of great Italian baritones, but Anselmo Colzani was never that far off. 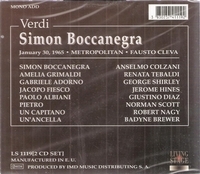 He also had to contend with an era in which the likes of Tito Gobbi, Ettore Bastianini and Giuseppe Taddei bestrode the world’s opera stages….He was in demand internationally too, making his Metropolitan Opera début in 1960, where he played Simon Boccanegra. There was a great deal of pressure on the new arrival, as the Met’s favourite baritone, Leonard Warren, had died weeks before. If Colzani never became the next Warren, he did become a Met regular. He sang 272 performances there over the next 16 seasons." “After winning the American Opera Auditions in New York, George Shirley was invited to play the role Rodolfo in LA BOHEME in Milan, Italy. In 1961, Shirley won first prize in the Metropolitan Opera Auditions, thus becoming the first African American tenor to be awarded a contract with that company, where he performed from 1961 through 1973. He played major roles in more than twenty operas, often performing with fellow African American opera pioneers Leontyne Price and Shirley Verrett. During and after his stint with the Metropolitan Opera, Shirley was a well sought tenor across the globe, appearing in productions in London, Italy, San Francisco, Washington D.C., Chicago, Boston and a host of other cities. Shirley also won a Grammy Award for the recording of his performance in Mozart’s COSÌ FAN TUTTE.